Strong rally in Chinese stocks is lifting Asian markets broadly higher today. Chinese president Xi Jinping is set to visit Italy, France and Monaco from March 21 to 26 this week. While there’s no detail on the visits yet, it’s believed that there could be signing of an agreement for Italy to join the Belt and Road infrastructure investment initiative. But while that might lift sentiments, the could look is still clouded by uncertainty in trade negotiations with the US. The highly anticipated Trump-Xi summit might only happen in April at the earliest, or in June alongside G20 summit in Japan, or might not happen at all. Nevertheless, the currency markets are following strong risk appetite with Australian Dollar leading other commodity currencies higher. Yen and Dollar are the weakest ones. Sterling is also sluggish ahead of another meaning vote on Brexit deal, most likely on Tuesday. 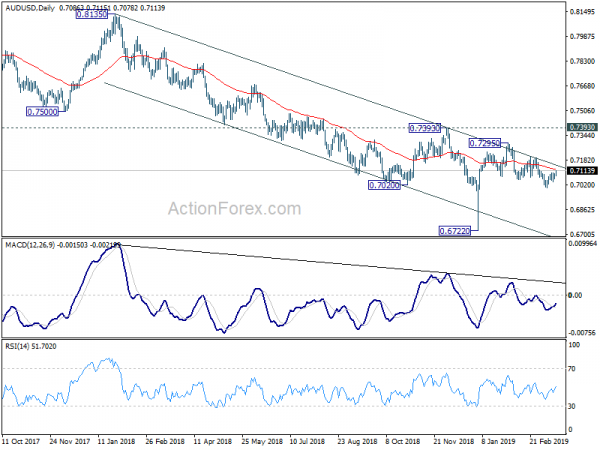 Technically, an immediate focus is 0.7121 minor resistance in AUD/USD. Break will suggest that recent decline from 0.7295 has completed and further rise would likely be seen back to 0.7206 resistance at least. In other markets, Nikkei is currently up 0.67%. Hong Kong HSI is up 0.73%. China Shanghai SSE is up 1.26%. Singapore Strait Times is up 0.41%. Japan 10-year JGB yield is down -0.0037 at 0.039. The UK Parliament will have meaningful vote on Prime Minister Theresa May’s Brexit deal for the third time this week. Ahead of that Chancellor of Exchequer Philip Hammond said a significant number of Conservatives have changed their mind last week to back the plan. And he expected more to come even though the government hasn’t had enough numbers yet. And, “it is a work in progress”. Last Tuesday, the Commons voted 391-242 to reject May’s “improved” deal. Back in January, the deal was voted down by 432-202. The British Chambers of Commerce (BCC) has downgraded UK growth forecast on “weaker outlook for business investment and trade amid continued Brexit uncertainty and slower expected global economic growth”. For 2019, growth forecast was downgraded from 1.3% to 1.2%. For 2020, growth forecasts was downgraded from 1.5% to 1.3%. in 2021, growth is projected to pick up slightly to 1.4%. Three central banks will meet this week, including Fed, SNB and BoE. BoJ and RBA will release meeting minutes too. Fed is expected to keep federal funds rate unchanged at 2.25-2.50%. “Patience” will remain the central tone of the statement and other communications. Fed might also announce the plan to end the balance sheet roll-off and that could catch some attentions. But main focus will be on the new economic projections. Since late December, Fed officials have sung a chorus indicating they’re in no hurry to lift interest rates unchanged. They finally have a chance to tell the markets the reasons for the change in stance with concrete numbers. SNB is expected to keep the sight deposit rate at -0.75%. The three-month Libor target range should be held at -1.25% to -0.25% too. The central bank should also maintain that it’s necessary to keep interest rate negative and pledge to intervene in the forex markets when needed. Such measures will keep the attractiveness of Swiss franc investments low and reduce upward pressure on the currency. In addition to central bank activities, there are a number of economic data to watch too. Eurozone PMIs will give some hints on whether the slowdown in Eurozone has past its worst. UK CPI will also be watched but it’s likely to be overshadowed by Brexit vote and BoE. Downward surprises in Australian house price and job data will add to the case of two RBA rate cut this year. 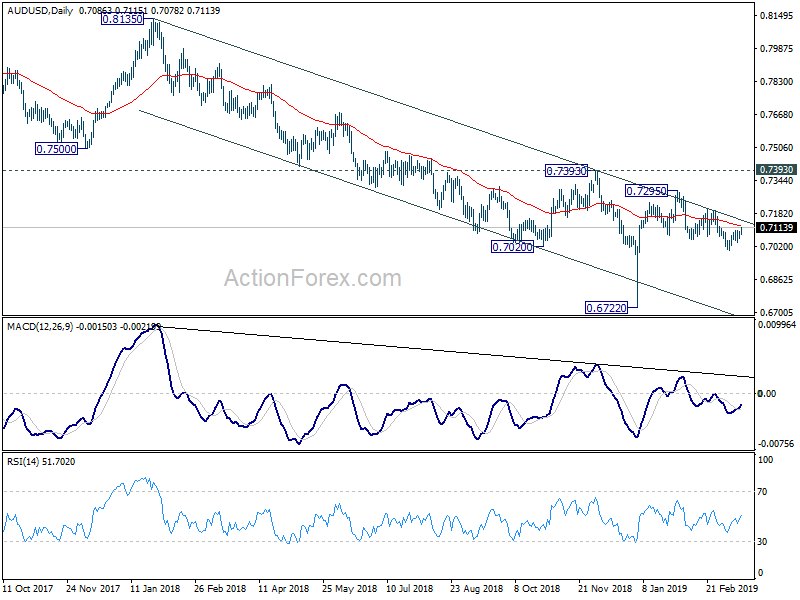 Canada CPI and retails sales could also be market moving. 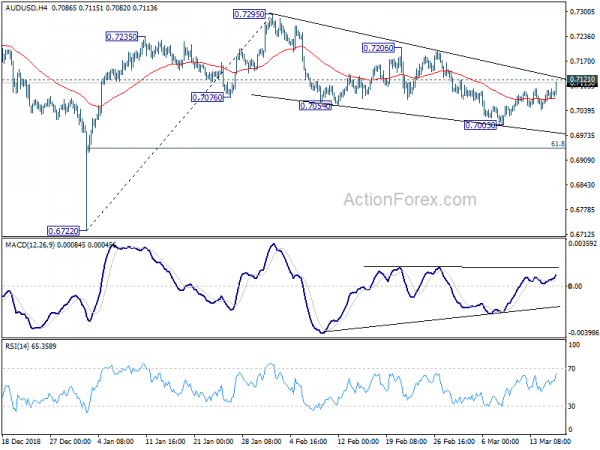 AUD/USD rises strongly today and focus is now on 0.7121 minor resistance. Firm break there will argue that decline from 0.7295 has completed at 0.7003. In that case, further rise should be seen to 0.7206 resistance to confirm. More importantly, in that case, corrective three wave structure of the fall fro 0.7296 to 0.7003 would suggest that rise from 0.6722 low is extending through 0.7295. On the downside, though, break of 0.7003 will extend the fall from 0.7295 to 61.8% retracement of 0.6722 to 0.7295 at 0.6941 and below.